Required Reading is DoomRocket’s love chest, opened twice monthly to champion a book that we adore. This week Arpad recommends ‘She Could Fly’, available now in trade from Berger Books, an imprint of Dark Horse Comics. 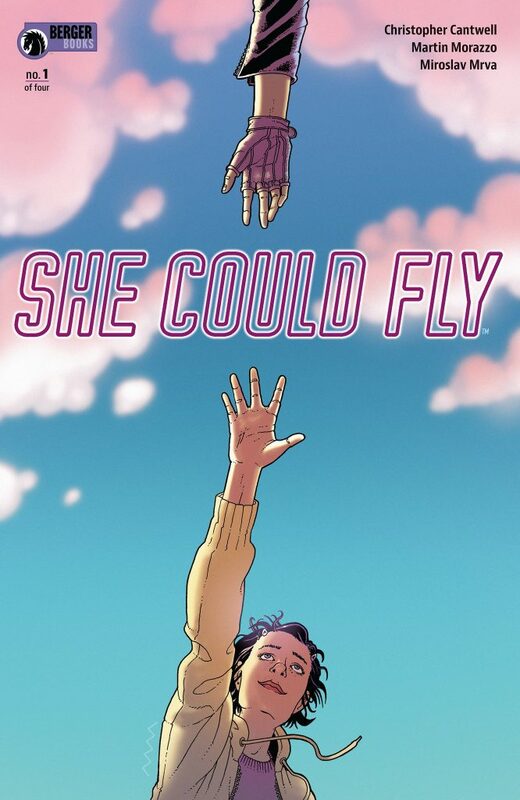 THIS REVIEW OF ‘SHE COULD FLY’ TPB IS SPOILER-FREE. by Arpad Okay. A woman with strange powers meets a stranger fate. Luna is her biggest fan. She’s tormented by visions of violence and by voices she can’t escape. The dream of flight is her only solace, the news of the girl who could fly her only sunshine. When the flying woman disappears, Luna is on the case. Bill is on the run. One slip, and he’s dead. His girl, his sister, his colleagues, dead, buried, burned. His course is a head-on collision with Luna because of one shared interest: the flying woman. Luna and Bill meet at the crossroads of mental health and murder. I can’t even tell you what’s wrong with Luna’s grandma. She Could Fly is real and unreal. It has some hard truths for you to deal with about the world inside Luna’s head. The world outside, the normal world, is rife with breakthroughs and backstabbing, nonsense better suited for a blockbuster movie than reality. A fallacious drama of corporate intrigue and superpowers stands in contrast against Luna’s inner problems so that we the reader can analyze the structures that allow each to stand. Luna’s mind swings homicidal, sure, but man’s world of capitalism is dangerous for real. 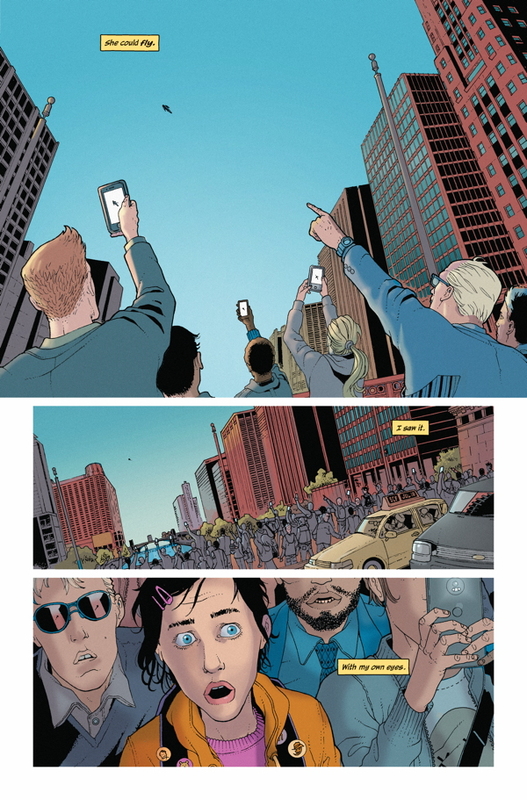 The writing of Christopher Cantwell and art by Martín Morazzo will take your breath away. Not cinema gasps. The depiction of Luna’s struggle with her mental health is unflinching, empathetic, unrestrained and unhinged. 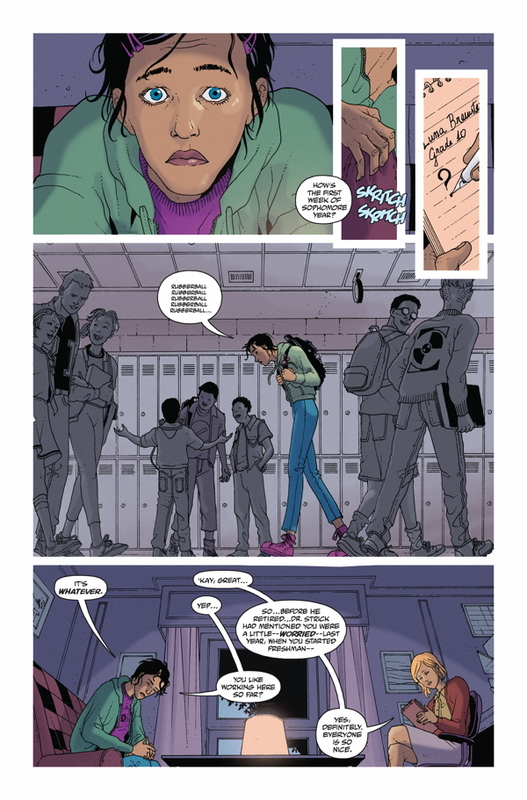 Clem Robins gets a real chance to shine lettering this book. The voice inside Luna telling her to kill, telling her she’s doomed to die, to disappoint, Robins scales it up so much larger and louder than any other word uttered in the book. You can not only see but feel the weight Luna bears. The fantasies of violence are disturbing, uncontrollable interruptions. Not only graphic and invasive, they are at times subtle, off-putting instead of earth-shaking. Nothing Luna goes through is understated, but it’s not just one loud constant, either. Luna’s visions of her therapist with smashed cat head chill the blood without putting the reader in shock like the fantasy of taking a bloody, ruinous bite out of a cactus does. Luna is complicated. Beyond, there’s the dubious quality of Luna’s therapist. There’s Luna’s family history (that grandma). Though it is intensely personal, it’s not just her. She Could Fly engages mental health as a product of environment as well as individual, as something that changes as a person changes. As health. She Could Fly also works as a legit spy thriller. Espionage, murder, real Jim Thompson types (bunglers) thinking they can when they can’t. Dealing with James Bond situations while going crazy, that’s beyond the pale. For all Luna’s fears about doing harm, guns, fire, and violence all come from men around her. It’s rational bloodbath. 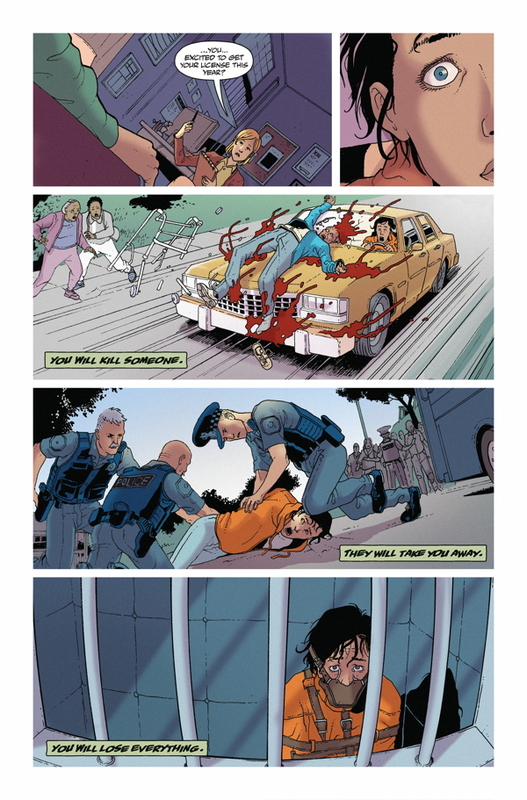 Morazzo is the best-suited artist in the industry to do this kind of book. Though we do get to sweep the curtain aside and see Luna’s dark dreams, it’s what we recognize in her face that drives what she’s going through home. Nobody does anxiety, disquiet, the mask of normalcy, the hope of the beaten, like Morazzo. The spaces occupied in She Could Fly play an interesting role as well. Ornate, normal rooms. Patterns, objects, industry give texture to the antiseptic clarity of linework in which the characters are placed. Isolated figures in a gilded cage. She Could Fly rarely places more than two or three people in a room. Crowds are normal and normal swiftly turns tragic. Miroslav Mrva’s colors are the soft touch. Lively in variety but muted in saturation. His style is a gentle wash, reminiscent of watercolors with the use of highlights and gradients, but digital smooth. Fixed. Set. Mrva reinforces the environment’s control over the folks in the story. Luna’s world is a trap. Does Luna have a choice? Anyone can pick up a gun, pull a trigger. Real strength is sparing lives, not taking them. Real strength is resilience. The reality that we live with—as stories like this push to extremes to try to remind us—is the burden is never lifted. You learn to live with it. Life may just be worth it. Live, and find out. 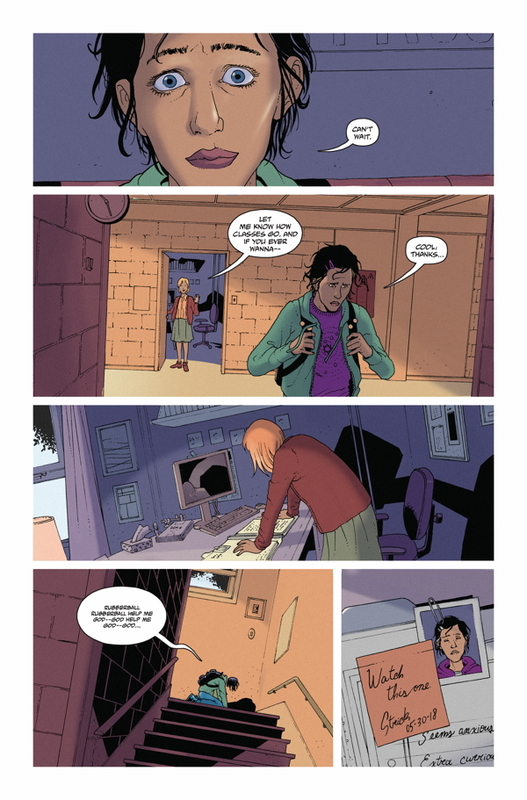 Check out this four-page preview of “She Could Fly’ TPB, courtesy of Berger Books, an imprint of Dark Horse Comics!